The Rescue of the Willey Handcart Company. Help did come, and afterwards the Levi Savage character in the movie commented: “a great deal of hardship still lay ahead of us…. But the hardest battle was behind us now, that fight that each of us must wage of faith against fear” (17 Miracles [Excel Entertainment Group, 2011]). It is that battle of fear against faith that I am writing about today. In watching many films in recent times a theme that has stood out to me again and again is that of the destructive power of fear: Batman Begins, Harry Potter 5, and other movies contain this idea. We all have our battles in life and times where the Lord seems to be ignoring or even punishing us and we know not why. We may ask “where is the Lord? I have done all I’ve been asked. Why this?” and worry ourselves constantly. Yet we need to trust in His arm—His power. We may face fear in our lives that we don’t even connect to God, but true faith in Him will allow us to overcome that fear. We all face the battle of fear vs. faith. We read in Lectures on Faith that: “fear, or doubt, existing in the mind, would preclude the possibility of the exercise of faith in him for life and salvation” (Lectures on Faith, 4:13) “and where doubt and uncertainty is, there faith is not, nor can it be. For doubt and faith do not exist in the same person at the same time” (ibid 6:12). To truly understand that statement, we must understand what faith is. A modern translation of Hebrews 11:1 reads: “Faith is confident assurance concerning what we hope for, and conviction about things we do not see” (New American Bible Heb 11:1). Assurance is “full confidence; freedom from doubt; certainty” (http://dictionary.reference.com/browse/assurance?s=t) and conviction is “a fixed or firm belief” (http://dictionary.reference.com/browse/conviction?s=t). Thus, it could be read that “Faith is confident certainty concerning what we hope for, and a fixed or firm belief about things we do not see.” In looking to the Book of Mormon we read: “faith is not to have a perfect knowledge of things; therefore if ye have faith ye hope for things which are not seen, which are true” (Alma 32:21; see also Ether 12:6). Hope is: “an abiding trust that the Lord will fulfill His promises to you” (Preach My Gospel , 117). If hope is an abiding trust and faith is deeply connected to hope, it could be said that faith is an abiding trust in things you cannot see—specifically God. When you trust that God lives, that His character is perfect, and that the system you are trying to live (i.e. your religion) is true, you will have strong faith that can lead you to marvelous things. When you begin to doubt the three fundamental things, your faith falters. When you experience fear, you are not experiencing confident certainty in the circumstances you’re in because you are doubting whether or not God is there, or if He will help you in the way that will help you the most. We learn that from Lectures on Faith, yet even after writing about faith, the authors of the lectures had their periods of fear and doubt. 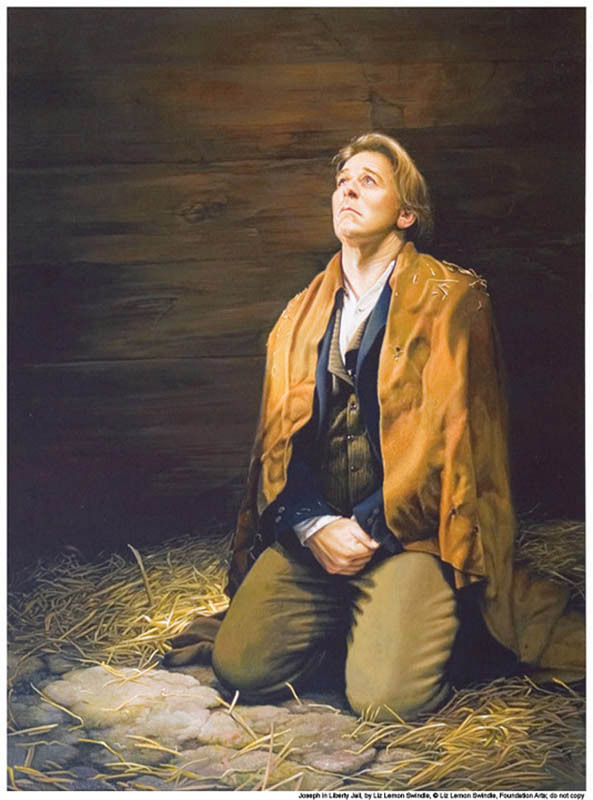 Joseph Smith cried out in Liberty Jail: “O God, where art thou? And where is the pavilion that covereth thy hiding place? How long shall thy hand be stayed, and thine eye, yea thy pure eye, behold from the eternal heavens the wrongs of thy people and of thy servants, and thine ear be penetrated with their cries?” (D&C 121:1-2.) His people had been driven from the promised land—the location of the New Jerusalem they were supposed to build. They had built a temple in Kirtland and received an endowment of power there only to have a large portion of the Church apostatize and force the faithful to flee to Far West, Missouri. His closest friends and associates had turned against him and betrayed him, and once more the saints were being driven from the city of Zion they had been called to build up while the leaders of the Church sat in a terrible prison. Everything he had prophesied and proclaimed about the place seemed to be frustrated and unfulfilled. Looking at this period in Church history, one may wonder why anyone would feel that God approved of the Church. Their faith was being tested and shaken to the core—even Joseph Smith’s. Those in ancient scriptures had their struggles as well. Sariah (Lehi’s wife) had her time of doubt. When Nephi and his brothers were up in Jerusalem for a long period of time “she had supposed that we had perished in the wilderness; and she also had complained against my father, telling him that he was a visionary man; saying: Behold thou hast led us forth from the land of our inheritance, and my sons are no more, and we perish in the wilderness” (1 Nephi 5:2). Her faith had been punctured by fear, and she doubted her husband and the revelation he had received. Those fears turned out to be unfounded, however, when her sons returned. She had experienced in her supposing what Mark Twain meant when he stated: “I have been through some terrible things in my life, some of which actually happened.” Sariah had her struggles in the battle of faith vs. fear. We all have these battles in our minds. We live in fear that things won’t work out, supposing as Sariah did that things are going wrong, when it isn’t necessarily so. I know I have spent a lot of energy thinking about what horrible things people could be doing and getting all worked up about it then nothing ever happens. I had one missionary companion who was approaching the end of his mission and was worrying himself sick about his family situation at home and whether or not he would be able to remain righteous after he was released. It’s been almost a year at this point, and he is doing great. The fear in our head was worse than reality. I have also had experiences where I have been paralyzed by fear to the point that I don’t go through with things I should have. One of my biggest regrets from my mission is all the people I didn’t talk to because I supposed that I would be annoying to them and doubted whether they would actually listen to our message. Fear of failure is such a paralyzing thing. We would do well to keep in mind these words of wisdom from J. K. Rowling: “some failure in life is inevitable. It is impossible to live without failing at something, unless you live so cautiously that you might as well not have lived at all – in which case, you fail by default.” (2008 Harvard Commencement Speech.) While fear of failure can paralyze us, we need to at least give things a try. 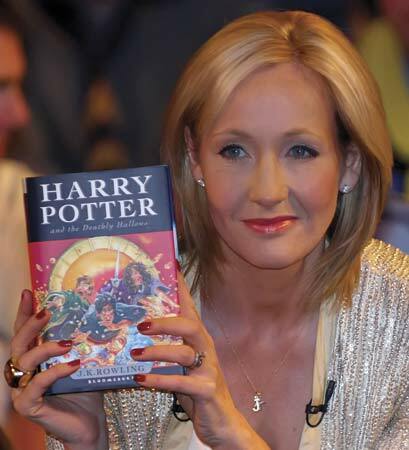 Rowling shared that comment from the depths of her experience: In that same speech she said: “a mere seven years after my graduation day, I had failed on an epic scale. An exceptionally short-lived marriage had imploded, and I was jobless, a lone parent, and as poor as it is possible to be in modern Britain, without being homeless. The fears that my parents had had for me, and that I had had for myself, had both come to pass, and by every usual standard, I was the biggest failure I knew. “Now, I am not going to stand here and tell you that failure is fun. That period of my life was a dark one… [but] I was set free, because my greatest fear had been realised, and I was still alive, and I still had a daughter whom I adored, and I had an old typewriter and a big idea. And so rock bottom became the solid foundation on which I rebuilt my life…. As for myself, when I overcame my fear and spoke to people on my mission, I found that while some did not respond well, many did, particularly when approached with faith that they would want to talk to us. We just need to remember what the newly-elected FDR stated during the Great Depression: “let me assert my firm belief that the only thing we have to fear is fear itself—nameless, unreasoning, unjustified terror which paralyzes needed efforts to convert retreat into advance.” (Franklin D. Roosevelt, Inaugural Address, March 4, 1933, as published in Samuel Rosenman, ed., The Public Papers of Franklin D. Roosevelt, Volume Two: The Year of Crisis, 1933 [New York: Random House, 1938], 11.) Overcoming paralytic fear will allow us to advance forward in our abilities and our lives. Joseph Smith overcame his fear of failure. He said: “I am like a huge, rough stone rolling down from a high mountain; and the only polishing I get is when some corner gets rubbed off by coming in contact with something else…. Thus I will become a smooth and polished shaft in the quiver of the Almighty.” (History of the Church, 5:401.) He wasn’t afraid to get out there and try something—if something went wrong, it would be a learning opportunity that made him smoother in the end. Mindy Gledhill captured this same feeling in a song where she proclaimed: “it’s falling that’s teaching me to fly.” We will fall from time to time, but we fall so we can learn to pick ourselves up and keep moving forward. From the experiences in Liberty Jail, Joseph learned more about God’s perspective about the hard things in life. In revelation, Joseph’s experiences were summarized and then the Lord stated: “know thou, my son, that all these things shall give thee experience, and shall be for thy good. The Son of Man hath descended below them all. Art thou greater than he? … Fear not what man can do, for God shall be with you forever, and ever.” (D&C 122:7-9.) Not all suffering is caused by the Lord, but He can turn all things to His uses. The Lord has our eternal salvation in mind above all else and sometimes uses suffering to give us the experience we need to become what we are meant to be. Sometimes the Lord will allow us to go through what seems a trial to improve us—sometimes we need trials to make us better. Sometimes He has something else in mind than what we—in our limited understanding—think we want. 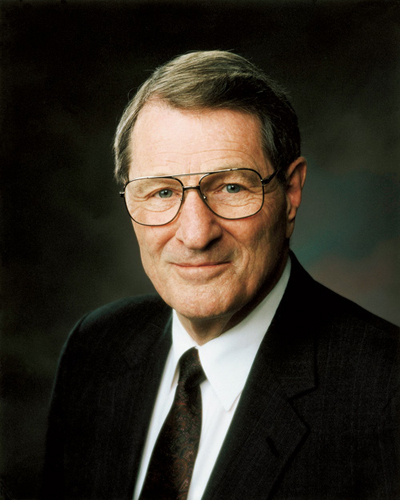 Concerning trials refining us, we may learn from Elder Neal A. Maxwell: “[The pathway to discipleship] is the only pathway where littering is permissible, even encouraged…. Along this pathway leading to consecration, stern and unsought challenges sometimes hasten this jettisoning, which is needed to achieve increased consecration (see Hel. 12:3)…. “John Taylor indicated that the Lord may even choose to wrench our very heartstrings (see Journal of Discourses, 14:360). If our hearts are set too much upon the things of this world, they may need to be wrenched, or broken, or undergo a mighty change (see Alma 5:12)” (“Swallowed Up in the Will of the Father,” Ensign Nov. 1995). Elder Maxwell didn’t just teach it, he lived it: his doctor shared with my mission that when Elder Maxwell was in the midst of the deepest pain from his medical conditions he would not ask: “why me?” Instead he would ask: “what does God want me to learn from this?” He was refined and purified by the trials he experienced, as we all may be. Others have had this same experience as well. Francis Webster—one member of the Martin handcart company—reportedly shared: “We suffered beyond anything you can imagine and many died of exposure and starvation…. Was I sorry that I chose to come by handcart? No! Neither then nor any minute of my life since. The price we paid to become acquainted with God was a privilege to pay and I am thankful that I was privileged to come in the Martin Handcart Company.” (http://mormontrekkers.com/Martin_company.htm) He had learned greater lessons in choosing to travel with the handcart company and suffering with them than he would have in any other way. Now, as for the Lord having something better than our plans, I recently went through a situation where that happened. I had applied to work for EFY (the Church’s summer activity for youth) for the summer and planned to do that for months on end. They never got back to me. My father advised me to start applying elsewhere and I did, but nothing was coming through—the few places that actually took the time to interview me did not accept me and rarely got back to me. I was frustrated—I had just gotten engaged and was trying to do what the Lord wanted me to do. I wanted to spend the summer up in the same town as my fiancé, but I wasn’t able to find a job up there before I had to leave my apartment, so I moved home. I was worried about finances as a soon-to-be young married couple. Ultimately, I just wanted a job, and nothing seemed to be panning out. I prayed and pled for the Lord to provide me with a job and felt that things would work out, but it wasn’t going to be EFY, as much as I wanted it. Still, I didn’t see it actually happening and continue to worry and experience constant frustration. Then, suddenly, it seemed as though everything straightened out—a classic Deus ex machina ending. The Lord reached down and provided for me—I was hired on for a paid internship for biological engineering at the University I attend. It was better than anything I could have asked—it was a job directly involved in my field of study up in the town my sweetheart lives working with the grad students and professors I’ll be studying around for years. What’s more, my great aunt agreed to house me for the summer at no cost. The Lord had something He was moving me towards, but I just couldn’t see what was going to happen and lived in fear as His hand moved me into position. Even after learning this lesson again and again, I still struggle to overcome my fear and be believing. I feel like the man in one moment declared: “Lord, I believe” and then (realizing my faith isn’t as strong as I thought) “help thou mine unbelief” (Mark 9:24). The Lord had better plans for me than I did, but I didn’t see them for a long time and lived in fear. Peter sank because he took his focus off of Christ and was afraid. 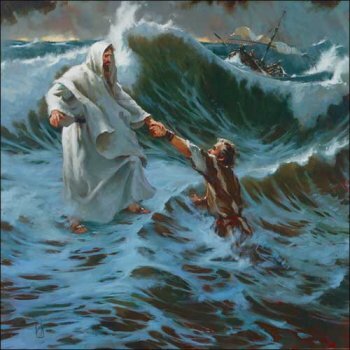 Peter had enough faith to begin walking on water—to act on what he had learned and believed—but when he took his focus off of Christ and focused on the storm around him “he was afraid.” That fear led to his faith breaking and he began to sink. So it is with each of us—when we take our focus off of Christ and begin to pay more attention to the storms around us, our faith will falter and our fear will flourish. The trick is to keep our focus on Christ and to keep in constant contact with the Comforter. How do we do this? Through remembering Christ, keeping His commandments, and taking His name upon us; through consistent scripture study, powerful prayer, church attendance, and serving others as Christ would. As we do these things with full intent (not just going through the motions) the Spirit will come into our lives and carry us through whatever storms may come. We will be at peace as we watch the boisterous wind around us. Then, Christ will reach out and save us at the exact moments we need. Faith has a short shelf life and needs constant restocking and these things are among the ways we may do so. So, remember—we all face a battle of fear vs. faith. Trust in Lord—the rescue party will come, you’ll be released from the troubles you’re imprisoned by, and things are often not as bad as we suppose. Where fear is, faith cannot be. Likewise, where faith is, fear cannot be. Don’t be paralyzed by fear and seek to gain all you can from any situation. Keep your focus on Christ and the Spirit and try to constantly replenish your faith. If you do these things you will master fear with faith and have peace in this life and the life to come. “For God hath not given us the spirit of fear; but of power, and of love, and of a sound mind.” (2 Tim 1:7.) “Wherefore, be of good cheer, and do not fear, for I the Lord am with you, and will stand by you” (D&C 68:6). “Be not faithless, but believing” (John 20:27). I don’t mind comments, by the way, if people have any.